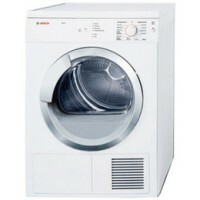 Dry clothes efficiently with this 24" electric dryer which comes loaded with a range of features for energy-efficient use. Take a good look at some of its features and some advantages and disadvantages cited by users. - The unit comes with a large stainless steel drum with textile care structure for gentle drying with the large soft design paddles. Gentle washing also means lesser lint that accumulates because washing does not break the fabrics down. - The snag-free stainless steel drum makes drying clothes a breeze. The drum withstands premature chipping and wear and can withstand faster drying spin cycles unlike porcelain or plastic tubs. - LED display allows to check the electronic settings with ease and prevent damage with one-touch button controls. - Touch control buttons lets you manage the settings with one touch of a button for Start/ Stop and low heat. - The dryer comes with special programs like low heat and freshen up for quick drying of smaller loads. - The intelligent moisture sensors adjusts cycle times as the dryer goes on with each cycle, cutting down energy usage by up to 50%. - Reduce wrinkles with the anti crease cycle that turns on for 60 minutes at the end of each drying cycle to reduce ironing time. - It comes with venting options supplied at the rear left and left side. - The glass door allows you to peer inside even while the dryer is on its cycle. - The machine comes with the Duotronic system with 11 dry cycles for customized drying of virtually any kind of fabrics in the load. - The easy-to-clean extremely fine mesh lint filter captures lint from the clothes to prevent blockages in the drainage and the exhaust system. - The Timed Dry feature allows you to set a duration for the drying cycle so you wont have to check on your laundry from time to time. - The compact design allows you to save more laundry room space. One of the main advantages to this unit is the energy-saving feature. The stackable design is an added plus, as well as the status indicators that tell you how long before the machine is done drying. Missing features like the delay start, wool option, air fluff/ no heat option are just some of the reasons why most people reconsider buying this dryer. It also tends to make a lot of noise at the end of each drying cycle. There is no interior light, another negative because this is present in other units in the same price range. Fine mesh filter also tends to clog up fairly quickly and the LED panel also breaks down easily. Caused smoke and fire smell! My Axxis dryer was purchased in 2010. The drum has defect. The contents of my dryer became lodged in the rotating drum. The dryer left burn marks on my clothes and cotton cloth napkins that were inside the machine. My 2 year old and I smelled it and saw the smoke, turning it off in time before a fire ensued. Bosch's response was to send a service person to check it out. After a full week of trying to get a response from Bosch, Bosch offered us 50% off of replacement parts and refused to cover labor. A new drum is at least $300 and labor near $200. THIS WAS A SAFETY HAZARD THAT COULD HAVE CAUSED A FIRE. Any respectable brand would replace this defect. It could not have been normal wear for a dryer this young, especially since we hang dry so much of our laundry. This product should be recalled. The service person had never seen anything like it on a model this recent. Do NOT buy this product. Bosch's customer service is horrible. Their supposed quality is a farce. I do not want to think about what would have happened to my home and family if I had not remained in our basement while this dryer was running. If you google "Bosch dryer smoke" you will see that this is NOT the first time this has happened. Come on Bosch, get your act together! Bed sheet ball - I'm over it! Yes! What is it with the sheets! It drives me CRAZY! If anyone finds a solution please let us know. Love the dryer except for this one thing. Why is this the only dryer that does this? I don't get it. I, too, am having difficulty with the Axis dryer and it's poor performance with sheets balling up. When I called Bosch, they recommended a 3" cone be added to the drum. The technicians want to charge $200 to install the drum in addition to the cost of the part, as they said my Axis is out of warranty. Well, I'm not doing it, as there are no guarantees this will work. Has anyone solved this problem? Please post. Bed sheets ALWAYS roll into a ball, wrapping up any other items in the dryer into a damp ball, pressing wrinkles into them. The Bosch Customer Service rep suggested drying sheets with other clothes; I have dried single, queen and king size sheets separately and combined, with and with-out other clothes, and with and with-out the dryer 'tennis' balls. I must check every 5-10 minutes to pull the sheet ball out and disentangle items, then return and repeat every 5-10 minutes until dry, the wrinkles are difficult to get out. I only have this problem with bed sheets. Previously I had a 24" Bosch dryer which did not do this, which is why I bought another.